Happy New Year! Today is our first Desktop update of the year. With this new year, we have a new release cadence as well. Up until this point, we've released our updates at the end of the month, but going forward we'll be releasing earlier in the month. Our first release with this new release cadence has several exciting improvements for tables and matrix and several connector improvements as well. If you'd like to see the features in action instead of reading about them, go ahead and download the file I used in this blog post. You can now enable word wrapping on table headers. Once enabled, word wrapping will happen on any manually-sized column. 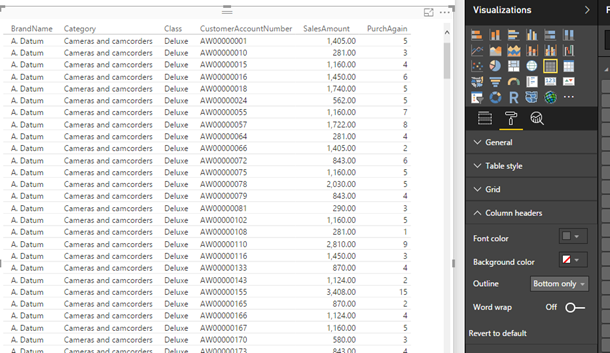 You’ll be able to resize the columns with word wrapping to get the exact layout you desire. Word wrapping splits on spaces and on long words with no hyphenation if they can't fit on a single line alone. You can now control how blanks are conditionally formatted on tables and matrices. 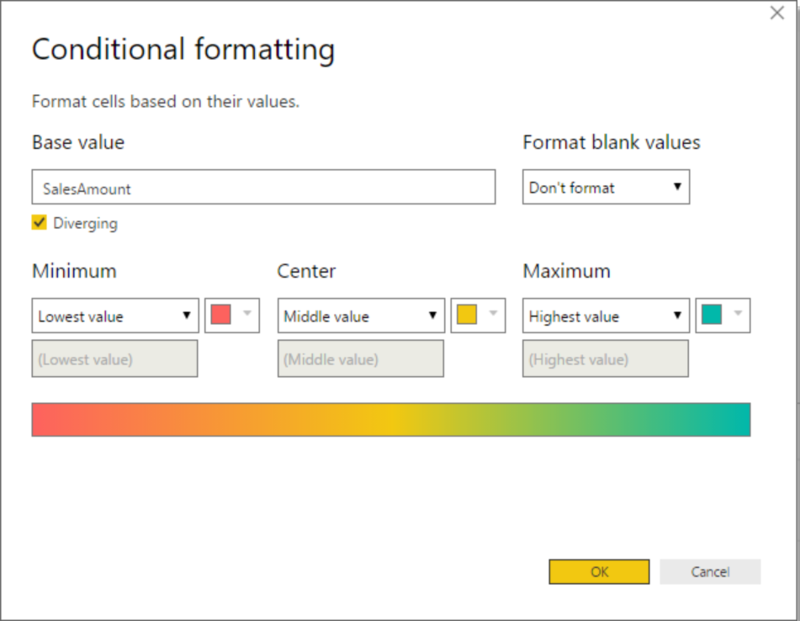 When you open the conditional formatting dialog, there is a new section, Format blank values, where you can pick the formatting method you want to use for your blank values. 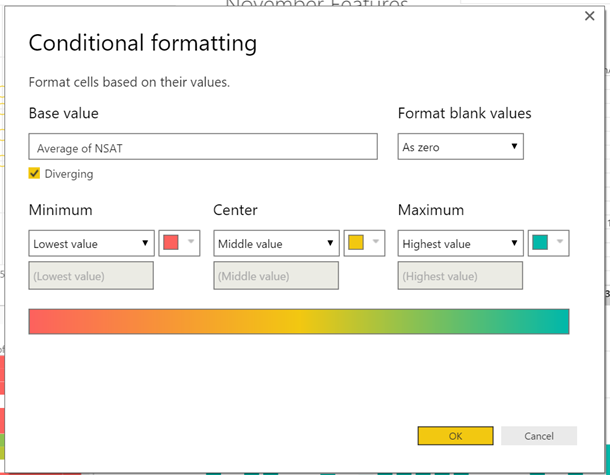 You can pick between As zero, Don’t format, and Specific color. If you select Specific color as your formatting method, you’ll be able to specify whatever color you want to use through a color picker. We’ve added new aggregation types for dateTime and string columns, which makes it easier to use strings and dates in matrices and tables and in tooltips. For dateTime columns, you can change the aggregation to Earliest or Latest in the right click menu of the field in the chart. This will return the Earliest or Latest date for the given context. This is especially useful if you want to show, for example, the last time a specific product was ordered. For strings, you can change the aggregation to First or Last in the same menu. This will return the First or Last string alphabetically for the given context. This is especially useful when you need to show more textual information in a data point’s tooltip. We are happy to announce the general availability of Power BI phone reports with this month’s release. Not too long ago, we announced the preview of phone reports, and thanks to all the great feedback we got during that time, have made many improvements to both the authoring and exploring experience. Now with the GA of phone reports, everyone can take advantage of this feature. This month we’re adding a new data connector, allowing you to connect and import data from your Visual Studio Team Services accounts. 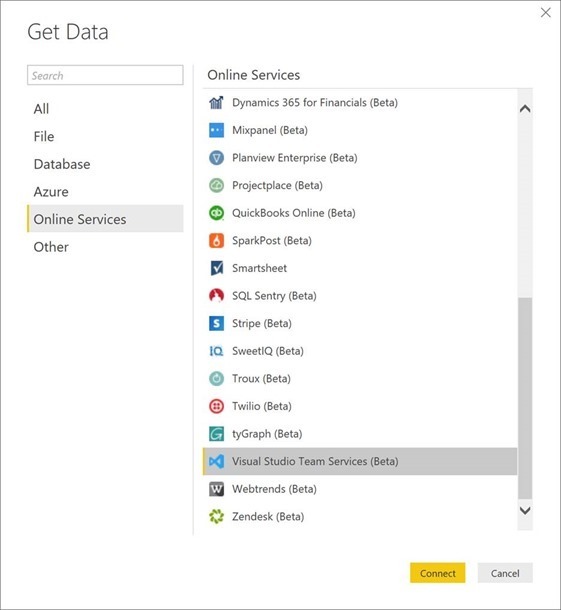 The new Visual Studio Team Services connector can be found under the Online Services category within the Get data dialog. 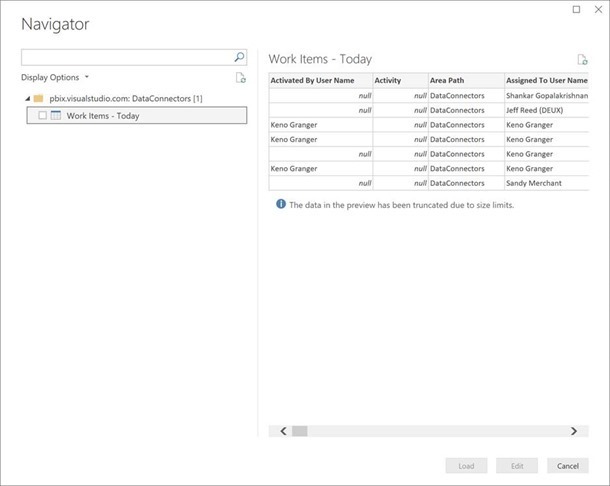 The VSTS connector dialog allows you to specify an account name, project name and, optionally, one or more area paths. After specifying the connection details, you will be taken into the Navigator dialog to select one or multiple tables from the list of available tables in your account. 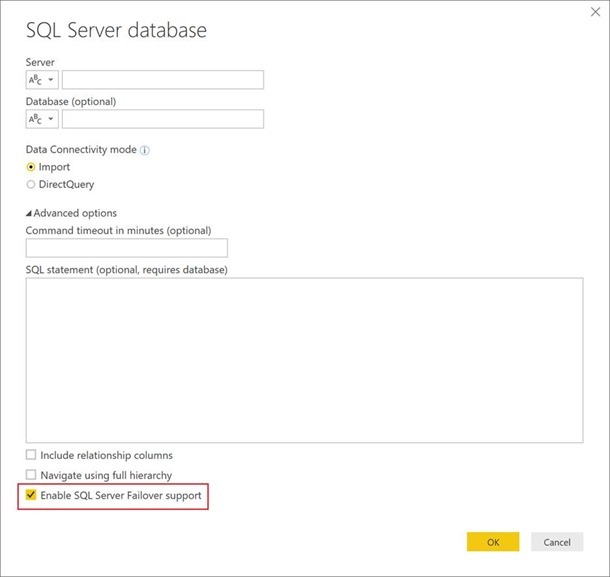 The SQL Server connector has been improved in this release, adding a new option to enable SQL Server Failover support. 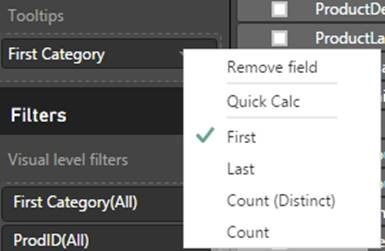 This new option can be found under the “Advanced Options” section in the SQL Server connector dialog. We’re making it easier to extract data values from a column containing nested lists. 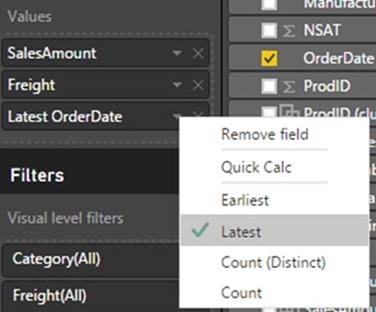 Before this update, you could expand nested lists within a column in a table, resulting in one new table row for each item within the nested list. Such capability is accessible via the column headers in a List column, or by using the “Expand” ribbon entry point. In this release, we’re adding a new “Extract values” transform which allows you to extract values from a list into a new Text column, with a delimiter in between these values. 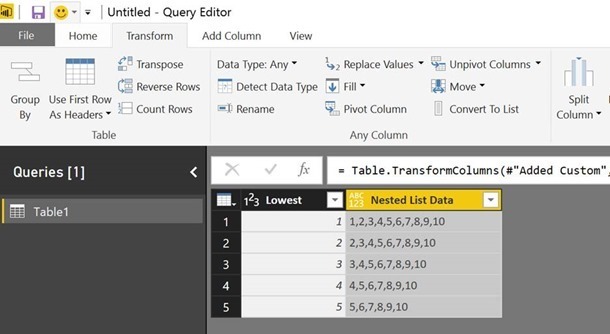 This new transformation can be accessed from the column header when a column with nested lists is selected. After selecting this transformation, you will get prompted to provide a delimiter to use in the new column. You will be able to pick from a list of predefined delimiters or specifying a custom one, which may also include special characters.